I don’t think our Founding Fathers at the time of our Revolution thought enough about money and how to obtain it. The army, such as it was, was irregularly paid if at all. There was no reliable way to raise revenue or system of taxation. So the Continental Congress embarked on the most dangerous fiscal policy, and the easiest; it started printing money, loads of it. 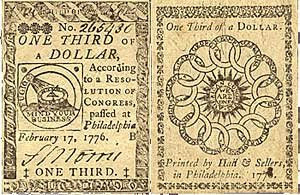 This paper currency had the dubious security of the promise of future revenues. The effect of these “continentals” was entirely predictable – roaring inflation, a rapidly depreciating currency, which ultimately was considered less than worthless. Even before the revolution, the money supply was unusual and often precarious. Colonies printed their own, for internal consumption. This quaint method may have worked in a very limited way, was but hardly suitable at a time of expanding commerce. The supply of coins was always limited, due to minting restrictions. Spain was a large supplier. Coins were adapted to smaller denominations by just cutting them into pieces. Many transactions relied on barter, available and well accepted. Tobacco and beaver pelts were often circulated. Barter has never disappeared. At the end of World War II in Europe, cigarettes were the currency of choice. Civilians had a very hard time during the revolutionary years. A serious labor shortage developed if men were drafted into the local militia. Goods became scarce through boycotts against British products or trade restrictions by Britain itself. Around 1780, the Congress knew that for the revolution to continue, large sums of money had to be borrowed from somewhere. John Adams, working quite alone initially, obtained a huge loan from Dutch bankers. France and Spain also became significant lenders. In a few years these loans were the principal source of revenue for the revolution. Today, we do exactly the same thing. The creditors are more varied, what we offer are called “Treasuries”, and they are sold at auction. Paying this interest puts an increasing burden on our GNP. Congress has a familiar method to handle Treasuries. When they become too burdensome, the debt ceiling is raised, and more become available. Dire economic predictions are made, and the cycle continues. The debt is constantly discussed; some economic voices don’t think it’s such a bad thing. During the revolution, some private financiers such as Robert Morris of Pennsylvania acted in a bail-out capacity for the Continental Congress, with some success. But an attempt to establish a national bank was mistrusted, and ultimately not accepted. Finally, only hard currency had value. I think the emerging United States were always teetering on the brink of financial disaster. The cost of loans and the lack of steady revenue could not continue indefinitely without a fiscal policy on a national scale. The effect of war debt really impacted Great Britain after the end of World War II. Then it faced huge costs to handle returning war veterans and a general population that would no longer accept the pre-war living standard. So there was severe austerity, including continuing food rationing and strict currency regulations. It was a very unhappy time in Great Britain. It certainly could no longer retain its empire. The following poem, by John McCrae, Canadian, 1872 – 1918, inspired the custom of selling artificial poppies to commemorate war dead on Memorial Day. The United States is at war. The newly fallen will join countless others to be honored and remembered this weekend. At the time of our Revolution, even before we had a constitution and a formal structure as a nation, many died fighting for liberty and patriotism. At the beginning of 1776, Tom Paine, a brilliant British immigrant, published his fiery pamphlet, Common Sense. Many claim that its message turned the colonies towards revolution, independence from the political and economic control of Great Britain. Dismissing best-sellers such as the Da Vinci Code and Harry Potter, can a blockbuster such as Common Sense change a nation’s thinking? Was it one of the causes of the American Revolution? Certainly, Paine’s core anti-monarchy message absolutely meshed with the colonial opinion that the British King George III was a threat to American liberty and progress. Combine that with the constant assault of Parliament’s taxes and tariffs, occupation by British troops, and other draconian measures, guaranteed Common Sense wouldn’t be ignored. Paine was an immigrant with a string of failures behind him when he arrived in prosperous Philadelphia. But he impressed people, got to know the right kind, including Franklin. He had enormous, varied interests; it didn’t take him long to become a journalist. He made good use of his skills. But his thinking was always ahead of his contemporaries. John Adams, with his conservative logic, didn’t like his ideas. He felt that, because of no moderation or balance, they would result in what I will describe as democratic bedlam. How many other publications have changed a nation’s thinking? I could not think of a whole lot. I will limit my selection to Das Kapital and Uncle Tom’s Cabin. Our Declaration of Independence will be discussed separately. If you really think about what changed the thinking and direction of the world, I think it would have to have been religions. Along the way, of course, they have generated enormous hatred and still do. I must confess that I haven’t always read book introductions. Many were too long and complex. But now I am a convert (that can be dangerous). Two volumes of Paine’s writings had excellent introductions by distinguished authors. Their commentary was illuminating. But colonials torn between loyalty to their traditional allegiance and the excitement and uncertainty of independence quickly caught on to Common Sense. It came at the right time at the right place. What precise moment determines when a person joins a revolution? Such a moment may not even actually exist. It could be a gradual process. A question for Friends of 1776: what would have happened without Common Sense at all? Paine spent many years here, including with the military. But his biography takes him much further. His subsequent digressions and accomplishments show again that when it comes to biography, truth is absolutely stranger than fiction. The greater intensity of his political thoughts, the more controversy he generated. Adapting a hit stage musical into a movie is not unusual, and often a great success. Think of The Sound of Music, West Side Story, and so many others. I just finished re-watching 1776 originally issued in 1972, and also a commentary version by the screenwriter and director. Much of the incredibly good production values and cast from the musical went straight into the movie. The result is bright, fresh, joyous, an excellent balance of words and music. The score by Sherman Edwards is masterful. 1776 portrays a group of quarrelsome men who arrive in Philadelphia for the 2nd Continental Congress. They are assembled during the hot summer days to discuss the evils of Great Britain, independence from George III. The result is the Declaration of Independence. The material is part fact, a lot of fiction. Does it matter? Of course not. The movie’s theme is the main attraction, not its accuracy. Call it “the history of the world according to Hollywood”. William Daniels, as Adams, is outstanding as the frustrated leader of the group. The others don’t like him – tell him to “sit down” (translation – shut up!) With beautiful music, Adams looks to Abigail for support, which she gives in her clever, down-to-earth manner. Franklin is the man of the world, catered to, witty, enough of a rake to make him interesting, right on target. John Hancock, as the Congress President, just wants to stick to business. He views the others as quarrelsome children, having their little fun, “festivities”, when they arrive in the mornings. Hancock is hot, tired, good at his job and an ardent patriot. The delegate from South Carolina, Rutledge, plays an important role. He brings up the issue of slavery, that “peculiar institution”; his solo is the most powerful number in the score. Rutledge holds all the trumps. Everyone knows, but doesn’t believe, that he can scuttle independence on the slavery issue. Jefferson, Adams forcefully protest, but Franklin reminds Adams, that when independence comes, all types of Americans will be together. Maybe the plantation owners aren’t his cup of tea, but they are part of the whole pot. The anti-slavery clause in the Declaration has to be deleted. The rather long, pretty episode of Jefferson and his visiting new wife seemed more tiresome than entertaining. This is the stock musical number, boy and girl. Of course, audiences love them. Why not; there are costumes, song, dance, and romance. For the movie, if there is a villain, it would have to be the Pennsylvania delegate, Dickinson. He is bitterly against independence, for reasons not entirely clear. His speeches in the script are too long, too many. A nice design feature is the use of the calendar instead of a clock. When the calendar says July 4, it’s the end of the show and the story. An issue has surfaced here locally. One of the junior colleges may establish an alternative nursing program. The college would have to comply with an accrediting commission, which stipulates fewer units for graduation, which involves dropping mandatory American History. All other students must take American History to graduate. The Trustees will debate the issue May 12 at 5:00 pm. Enclosed is a copy of my e-mail to the Trustees. I find the proposal unacceptable. Important questions have not been raised. As a reminder, your blogger is not a historian, history teacher, or part of the nursing profession. I am a librarian. Dear Friends: how should this volatile issue be handled? Next week you may decide to establish an alternative nursing program. You want to comply with the program’s National League for Nursing Accrediting Commission. They want fewer units for graduation, including dropping the history requirement, which all other students have to fulfill. I find the proposal without logic or merit. The reasons for fewer units are not clear to me. Is the Commission’s income linked to the number of graduates? Is there a hidden bias against teaching American history? Just what kind of degree would be awarded? It seems closer to the traditional LVN designation. The Commission needs to be asked some very direct questions. Why teach history to the other students? Because you know it is a foundation subject, a basic summary of what this country is. Do you feel nurses wouldn’t benefit? In the near future, they will face increasing ethical questions because of the increasing older population. American History & Institutions is very pertinent. I find the alternative proposal unacceptable. Do not consider it. Find out the basis for your Accrediting Commission’s requirements. This way, you will continue to graduate competent, well-educated nurses. They will be a credit to Palomar College and our community. Of all the individuals who pushed the American colonies into revolution, no one was more successful than Samuel Adams. He was a journalist with no ethics at all, a political commentator, and community organizer. He could wage a furious vendetta against an individual such as the Royal Governor of Massachusetts, Thomas Hutchinson, foregoing any semblance of objectivity or even truth. How did he do all this? He was very good at the job he had selected. Samuel Adams (his younger cousin was John Adams) was a rebel, revolutionary, radical, troublemaker, militant agitator; one of a kind. As you might read and learn more about him, you will probably be able to add your own assessment of his personality. It’s possible you might consider him quite out of his mind. In the many incendiary years before 1776, for every group that either led the colonies closer to armed conflict or actually caused it, he was either the founder or leader. His convictions were without compromise; he was powerful and influential. Certainly, Great Britain had no worse enemy. The formation of the American Revolution took decades. Adams did not reach 1776 as a young man. Rather, he matured during those many years when the American colonies were definitely changing in their attitudes toward Great Britain. The many tax acts before 1776 that increasingly infuriated the colonies also infuriated Adams. Certainly, there really was nothing in Samuel’s background that would have indicated the directions he would take. In fact, his family was sober, hard-working, and connected to a land bank, which seemed to be well-regarded in the community. Adams didn’t know what he wanted to do. Nothing unusual about that. However, the failure of the land bank was the catalyst which started defining Samuel. The bank was closed by an Act of Parliament. Domestic competition seems to have been the problem. Even now with money short, Samuel was still able to go to Harvard, a suitable introduction to a good career. However, suggestions such as the ministry, law, business fell on deaf ears. What he wanted to study were the political issues of the day, and write his opinions about them, increasingly militant, anti-British. He got lucky. So-called newspapers of the day operated outside of any code or journalistic ethics. Adams found the perfect match for his venom. The Boston Gazette, a more notorious newspaper at the time, essentially turned over its content to him. Readership was good. Some of them even took his tirades literally, and at one point, wrecked the property of the Royal Governor Hutchinson. Even the Gazette was appalled. Samuel now had a clear platform for his revolutionary views. His inflammatory words blamed British soldiers entirely for the "Boston Massacre". In 1773, it is believed that he plotted and executed the Boston Tea Party. By now, the British had a hefty price on his head. Fortunately, Paul Revere warned Adams and fellow-patriot John Hancock to evade capture. The colonies were on the brink of war with Britain. Adams was the powder keg of the revolution. Would it have happened without him? Yes, I think so, but not so soon. In his later years, Samuel seems to have mellowed, with many interests. "Your adversaries are composed of wretches who laugh at the rights of humanity, who turn religion into derision, and would for higher wages direct their swords against their leaders or their country –"
"What a glorious morning for America"